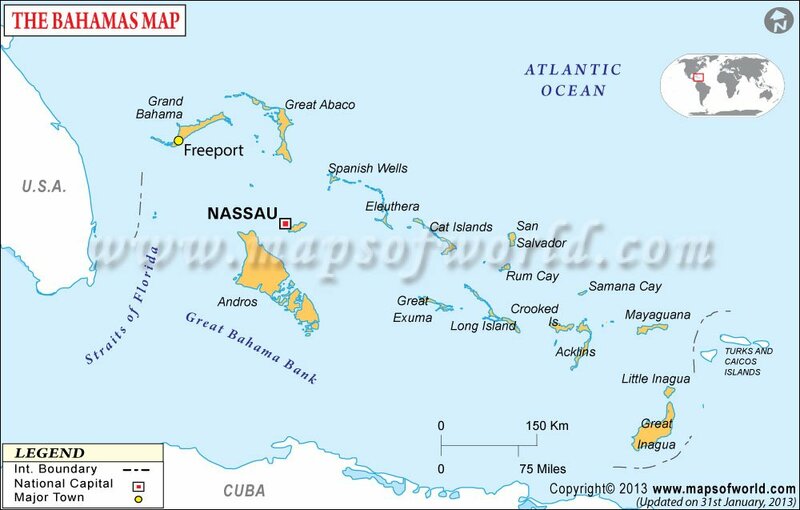 Explore map of Bahamas, it is officially known as the Commonwealth of the Bahamas, Bahamas is situated in the Atlantic Ocean and comprises of many island, islets and cays. It lies to the north of Cuba and Hispaniola, southeast of the United States and northwest of the Turks and Caicos Islands. The Bahamas were first inhabited by the Taino, Arawak people who migrated from South America, and arrived in the islands as far back as the year 500, first stopping on Hispaniola before reaching the Bahamas. The Lucayan tribe of Tainos flourished in the Caribbean and expanded across many islands of the Bahamas over the next several centuries. European explorers arrived in the 15th century, with the Spanish voyage of Christopher Columbus, which reached the Bahamas in 1492, and effectively initiated the discovery of the New World. Though the Spanish did not settle the Bahamas, because of the lack of gold and resources, they did transport many of the Lucayans to other islands as slaves, depopulating the islands. Some English explorers fled from Bermuda and established an unofficial colony of Eleuthera, which survived on salvaging shipwrecks, but struggled. The other settlement by Bermudans was the New Providence settlement. These settlers came into conflict with the Spanish, who were the target of most of the shipwrecks. The Spanish teamed up with the Spanish to attack the British colonists in the early 1700s. Without government, the islands were taken over by pirates. The Bahamas became a British Crown Colony in 1718, but over the next decades the Spanish battled for control. The Bahamas were handed over to Britain with the 1783 Treaty of Paris. With the loss of the American colonies, British loyalists from the United States began to populate the Bahamas along with their slaves, establishing plantations until slavery was abolished. This caused conflict between the colony of the Bahamas and the United States, as the islands had been a stop on the slave trade routes, and the British refused to be part of it, instead freeing the slaves. In 1964, the Bahamas became a self-governing nation, gaining independence as a Commonwealth in 1973. Nearby nations include Cuba, Dominican Republic and Haiti, Turks and Caicos, and the US state of Florida. An island nation within the Caribbean in the Atlantic Ocean, the Bahamas are made up of over 700 islands and cays. Fewer than 40 of these are inhabited by humans, however. The major islands of the Bahamas include Andros Island, the largest in the country, followed by Great Inagua, as well as Grand Bahama, Great Abaco, Eleuthera, San Salvador, Acklins, Mayaguana, Crooked Island, and Cat Island. As an island nation, much of the country lies in coastal regions with pink sandy beaches and coral reefs. These tropical islands were once heavily forested, but with the cultivation of cash crops, many of the forests were destroyed. Today the terrain is largely covered in mangrove swamps with rocky regions, and some pine and tropical forests,. The islands are mostly flat, with the highest point, Mount Alvernia, sitting at an elevation of just 63 meters (206 feet) on Cat Island. There are no real rivers in the Bahamas, except the Goose River, which is really a tidal creek. The islands of the Bahamas are best known for the beautiful beaches and clear waters, as well as the colorful culture. In Nassau, visitors can explore the Old Town with its colonial era architecture mixed with vibrant and colorful buildings. The city is also home to several museums, including the Pirate Museum and art gallery. There are also old forts, like Fort Fincastle, which were used to protect the island in its early days. The markets of Nassau can be a great place to experience the local culture, although there are plenty of tourist traps as well. The major airports in the Bahamas are Nassau's Lynden Pindling International and Grand Bahama International in Freeport. There are also several smaller airports in other cities across the islands that can be a good way to get between the various islands. The other main way of getting into the Bahamas is by boat, with many cruise ships making stops in Nassau and Freeport. Many of these cruises depart from Florida and other Caribbean islands. Boats are also a popular way of getting around the islands, often as the cheapest method of travel. Boat travel can take much longer than air travel, but they are the main method of travel to many of the smaller islands. In the major cities, plenty of taxis are available, but they can be somewhat expensive. Buses are available around Nassau, and minibuses known as the jitney, can be an inexpensive option. The current official flag of Bahamas was adopted on 10th July 1973 and comprises of three horizontal stripes in aquamarine and gold color, the gold stripe lies in the middle of aquamarine stripes. The flag also consists of a black equilateral triangle based on the hoist side.